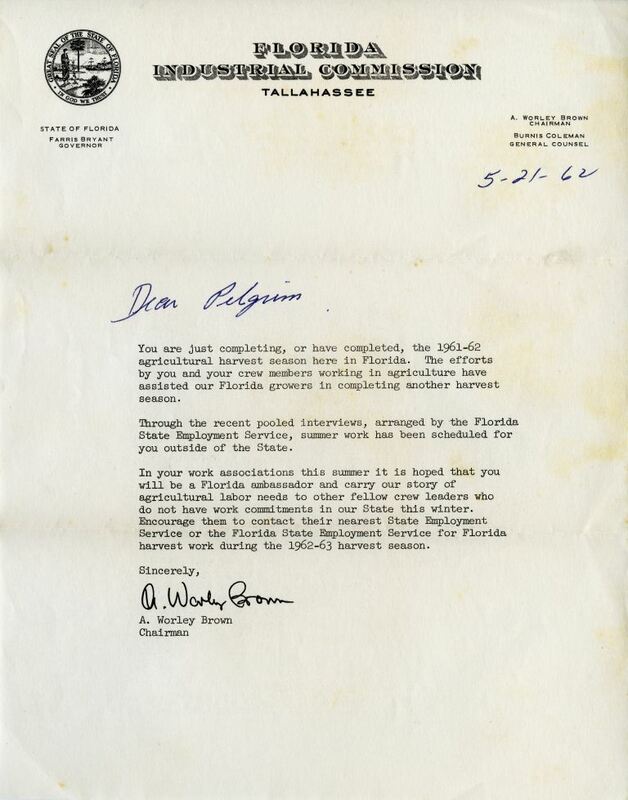 Letter of correspondence from A. Worley Brown, chairman of the Florida Industrial Commission, to Pilgrim Black written on May 21, 1962. In the letter, Brown informs Black that he has been scheduled for summer agricultural labor outside of Florida, as approved by the Florida State Employment Service. Original letter from A. Worley Brown to Pilgrim Black, May 21, 1962: Private Collection of Patricia Ann Black. Digital reproduction of original letter from A. Worley Brown to Pilgrim Black, May 21, 1962. Originally created by A. Worley Brown and owned by Pilgrim Black. You are just completing, or have completed, the 1961-62 agricultural harvest season here in Florida. The efforts by you and your crew members working in agriculture have assisted our florida growers in completing another harvest season. Through the recent pooled interviews, arranged by the Florida State Employment Service, summer work has been scheduled for you outside of the State. In your work associations this summer it is hoped that you will be a Florida ambassador and carry our story of agricultural labor needs to other fellow crew leaders who do not have work commitments in our State this winter. Encourage them to contact their nearest State Employment service or the Florida State Employment Service for florida harvset work during the 1962-63 harvest season. Brown, A. Worley. 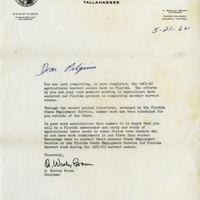 “Letter from A. Worley Brown to Pilgrim Black (May 21, 1962).” RICHES of Central Florida accessed April 20, 2019, https://richesmi.cah.ucf.edu/omeka/items/show/2663.